Save up to 40% off apparel from Drury Bookstore online. Save 50% off select textbooks when buy them online from the Drury Bookstore. Shop clearance at Drury Bookstore for up to 75% off top items. 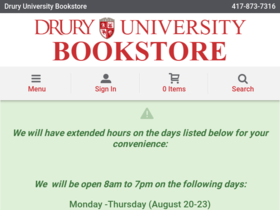 Check out Drury University Bookstore online for their latest special offers.